Kia Motors UK Ltd, is delighted to announce a partnership with Brotherwood, one of the UK’s leading vehicle converters, specialising in customising cars for wheelchair-using passengers. 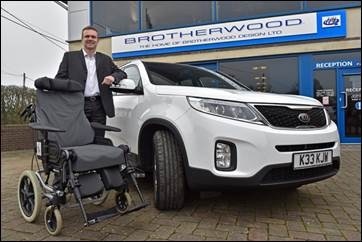 This month sees Brotherwood become the first vehicle converter to offer the Kia Sorento to the UK’s wheelchair passenger market. 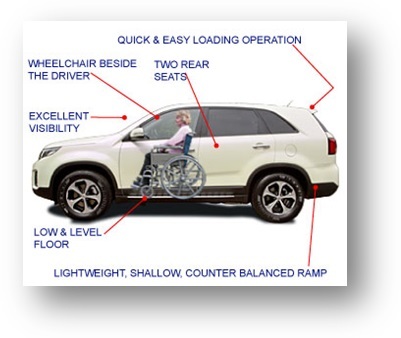 Adapting the car to provide users with a sleekly designed SUV on the outside, Brotherwood has transformed the inside of the Sorento’s cabin for quick and simple wheelchair access to journey as a front-seat passenger. In close conjunction with Kia, Brotherwood has worked to ensure that everything from the Sorento’s sleek yet bold design to its industry-leading seven year warranty is retained for its customers. Using the base vehicle design from Kia, the engineering team at Brotherwood has converted the Sorento to feature rear-access via a specially designed ramp. With back seats that fold easily to one side, the wheelchair user simply enters the car and is stationed next to the driver’s seat, secured safely by a harness. The front passenger cabin has been lowered to allow for the wheelchair user to sit at the same height as the driver for comfortable visibility, as well as giving a lower centre of gravity for greater stability when in transit. Be the first to comment on "Kia partners with Brotherwood to launch disability-access Sorento"